This differential will grow in the near-term unless New Delhi decides to sacrifice electricity for warheads. Pakistan has, in effect, decided to make this trade-off by investing in four plutonium production reactors instead of power plants. India’s leaders have so far been unwilling to accept this trade-off. India is nonetheless competing, and competing seriously – albeit far below its capabilities. Like Pakistan, it has flight-tested many new nuclear-weapon-capable delivery vehicles. New Delhi has two big-ticket items – a new class of nuclear-powered submarines and a longer-range missile. Both are geared toward China, although the submarine will initially carry short-range missiles until longer-range ones are available. India’s leaders might decide to pick up the pace of their end of the competition, but for now, they appear to remain committed to their stated nuclear doctrine of credible, minimum deterrence. We see no evidence that India is engaged in a nuclear arms race. Political leaders of both major parties view nuclear weapons as political, not militarily useful, instruments. Pakistan’s military leaders view nuclear weapons differently. They take nuclear requirements very seriously, and they think hard about the use of nuclear weapons in the event deterrence fails. Since the U.S.-India civil nuclear agreement, which opens significant pathways for New Delhi to increase future fissile material production, Rawalpindi has adopted a nuclear posture of “full-spectrum” deterrence, which suggests greater requirements for nuclear weapons, including short-range missiles and perhaps other kinds of tactical nuclear weapons, as well as longer-range systems. The stewards of Pakistan’s nuclear arsenal have told us for many years that they are almost within sight of meeting their nuclear weapon requirements. But they continue to block negotiations on a fissile material cut-off treaty, and they have invested significant sums in plutonium production reactors of recent vintage. Kahuta continues to enrich uranium. We see no evidence, as yet, that Pakistan’s nuclear requirements are tailing off. Arms competitions feed off of asymmetries, and the asymmetries in the Pakistan-India competition are extremely marked. India has to deal with two nuclear-armed neighbors; Pakistan plans against one. This asymmetry negates nuclear arms control as practiced during the Cold War. India has far greater potential to out-compete Pakistan, especially on fissile material for weapons, which is why Rawalpindi appears to be manufacturing more new warheads than any other country. Pakistan looks at India’s stocks of reactor-grade material, its breeder program, and it’s highly-enriched uranium program for naval nuclear propulsion, and sees bomb-making potential – even as it is out-producing India on fissile material dedicated for weapons by approximately four-to-one. Pakistan is not now a normal state with nuclear weapons. It’s not normal for a state with a weak economy and pressing domestic needs to produce perhaps 20 warheads annually. Members of NSG, with the exception of China, are unlikely to view Pakistan’s quest for membership favorably under these circumstances. Even Beijing is likely to be unhappy with the pace of Pakistan’s new warhead production, which reportedly outpaces its own. China appears to have stopped producing fissile material dedicated for weapons before joining the NSG. Toby and I argue that Pakistan will not be able to duplicate India’s path toward nuclear normalcy as it has neither the market nor the geopolitical clout that gained India the NSG’s stamp of approval on a civil-nuclear deal. Only China will sell power reactors to Pakistan on generous, concessionary terms. To our way of thinking, only nuclear-weapon-related initiatives offer a chance for Pakistan’s quest to gain entry into the nuclear mainstream. We suggest five initiatives for consideration: pulling back from full-spectrum deterrence, especially requirements for short-range systems that raise significant concerns for nuclear safety and security and that can foil a homeland, conventional defense by Pakistan’s Army; reconsidering Pakistan’s veto on FMCT negotiations and fissile material requirements; separating civilian from military nuclear facilities; and signing the CTBT – but not ratifying it – before India. We suggest that a CTBT signature be accompanied by a statement that, in the event India tests, Pakistan would exercise the Treaty’s supreme national interest clause and resume testing, as well. All of these steps would be extremely hard for Pakistan’s military and political leaders to accept – none more so than a CTBT signature without waiting for India. They would mark a significant departure from Pakistan’s long-standing policies and penchant for transactional bargaining. Pakistan will not, however, gain anything in trade because Pakistan is not amenable to trade: Requirements are set by Rawalpindi; unless Rawalpindi reassesses its requirements, our suggestions will fall on deaf ears. No political leader in Pakistan can make these decisions without the public support of Pakistan’s military leaders. So why might our suggestions receive a thoughtful hearing? Why might some of them even be adopted over time? Because they would serve Pakistan’s national, social and economic security interests. Because more nuclear weapons do not translate into stronger deterrence. Because they would advance Pakistan’s quest to be viewed as a normal state possessing nuclear weapons. And they would change views of Pakistan, energize its diplomacy, and facilitate Pakistan’s entry into the NSG, while setting the criteria for India’s membership. The paper dated September 8, 1981 claimed that New Delhi was also concerned about advances made by Pakistan in acquiring a nuclear weapon. —Is this old news, or new news? 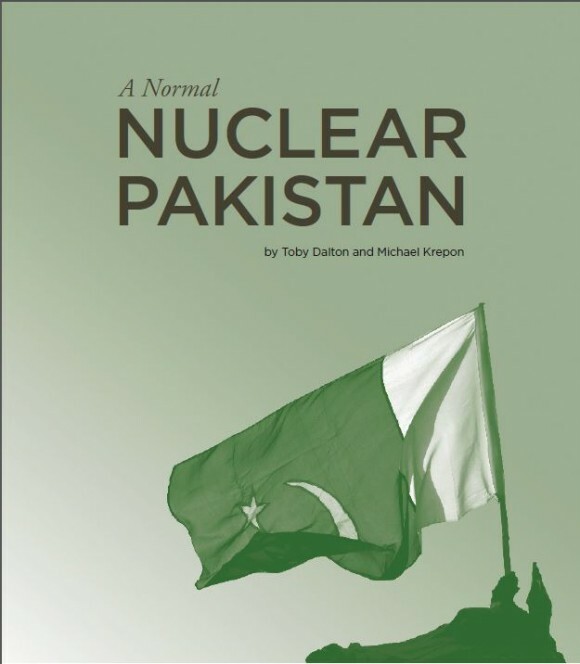 The author somehow wants defnaging of India and Pakistan of their nukes which I think will not happen.Foe Pakistan its nukes are a detterence and it thinks it allows it to use terrorism as weapon without facing rretaliation. Most probably this scenario may change. Hmmm. This is truely interesting stuff. Good thinking and maybe this could work and create improvements in the South Asian – Chinese deterrence triangulations. And create movement for the rest of the world as well as concerns the CTBT and FMCT. A welcome discussion. There is no mainstream with two nuclear weapon states having their respective civil nuclear programs – not part of it. The mainstream needs to be mainstreamed. What are the respective incentives then if material needs continue to be met!! It is confusing to separate full spectrum and strategic deterrence . I know the idea is to separate counter value and counter force but a deterrence that starts to fail even tactically will quickly fail strategically. Perhaps for Pakistan the gravest crises is not death of the State but the beginning of it and they want to avoid it by avoiding conflict at the first place. Adding numbers to your argument has made it weaker. No evidence of Pakistan adding 20 warheads and India 5. Only assumptions that Pakistan is weaponising its fissile material and India is not. The article says that Pakistan cannot duplicate India’s path to normalcy but then concludes that following the suggested path Pakistan will set a criteria for India’s entry in NSG….. Hmm what are we saying here ! Nuke race could be slowed down .If un-discriminated quality education is provided to common people of both nations . They will never support war then. A wave of extremism is found in people and military of both sides how ever politicians’ are damn corrupt and self centered in India as well as Pakistan. ‘Normal’ and ‘nuclear’ do not belong together. It is amazing that Mr. Krepon would like Pakistanis to sign CTBT before India does to morally pressure India. India does not care about Pakistan,and for Pakistan to sign CTBT would further put Islamabad in an inferior position. Plus, Mr. Krepon’s reputation in Pakistan is that of a man who is pro-India and whatever he would say would be taken with a giant grain of salt in Islamabad. Mr. Krepon needs to first earn Pakistani peoples’ respect before he asks them to listen to his advice. Suggestion for Mr. Krepon: Mr. Krepon loves to give suggestions to Pakistan as an expert. While I am no expert but as a lay Pakistani, I have a suggestion for him so that Islamabad may listen to him. My humble suggestion to Mr. Krepon is this: Please work on shedding your image of an India-Loving man. You are trying to win over Pakistanis via logic (Logos) but you also need to win their hearts (via Pathos). Mr. Krepon, Mr. Krepon, do you hear me? You got the Ehthos and you got the Logos but you miss Pathos. And Pathos is the most important part of convincing someone – am I wrong ? These proposals to help Pakistan enter the nuclear order in some more legitimate capacity are interesting. As a long-run proposition, any proposal to reduce or eliminate nuclear weapons globally must include India and Pakistan. If implemented, these proposals would also reduce the risk of nuclear war between Pakistan and India. Pakistan may feel most comfortable implementing these or similar proposals as part of a group effort, in which at least one or two other nations are making concessions as part of a package deal. Nuclear deals involving Pakistan might be most effectively negotiated by a group that includes, at a minimum, the United States, Russia, China, India, and Pakistan. Nuclear weapons can not be eliminated – period. The main reason is simple: USA, Russia, China, France, and England will never give up their weapons. Additional reason is: the USA will never ask Israel to give up its nuclear weapons. So what moral authority do the five established nuclear powers have to ask India and Pakistan to curtail their nuclear weapons? Pakistan is not stupid. She sees what India did to her back in 1971 and believes that India would have not dared to do so if Pakistan had nuclear weapons back then. Pakistan has also seen what major nuclear powers, with impunity, did to Iraq and then to Libya in recent years. Yet, the same nuclear powers did nothing against North Korea because that will put South Korea in nuclear threat. If Mr. Krepon wants Pakistan to listen to his suggestions then he should first ask the established nuclear powers to make Pakistan feel comfortable by accepting Pakistan (including India) as established nuclear power and stay away from any threat of sanctions. If Mr. Krepon is worried about Pakistan’s economic stability then why does he not ask Washington to allow Iran-Pakistan gas pipeline which can reduce Pakistan’s electricity shortage enormously. Nuclear arms control is not about morality, unilateral disarmament, or even global zero. Arms control is about negotiating agreements of mutual benefit to two or more countries for the purpose of a) reducing the likelihood of nuclear war, b) reducing the size of catastrophe if nuclear war does occur, and c) reducing the level of nuclear expense, in roughly that order of importance. Pakistan and India have a strong mutual interest in achieving all three of these outcomes. Nevertheless, for some strange reason they are barely willing to talk to each other. Perhaps Pakistan and India would be willing to talk to each other as part of nuclear negotiations in the presence of third parties. That is my suggestion. Folks, the problem is as much for Pakistan as anyone else. Their rate of production of weapons could well spark a lengthy arms race with India. This would not be to Pakistan’s benefit. It’s a bad plan economically: India is far more capable of paying for such a race than is Pakistan. And it’s a bad plan from a security point of view: the more nuclear weapons in the region, the greater the chance of accident or misuse. This is especially the case for short-range systems. If Pakistan’s weapon production continues at this pace, the arms race could well expand beyond just India. It does not help Pakistan to see a world with more nuclear weapons. They will have bought, at great expense to themselves, a more dangerous world. It’s up to Pakistan’s leadership, of course, to decide what they consider to be an optimal number, that’s not in doubt. But headlong production of large numbers cannot possibly end well for Pakistan. It’s far less risky for them to simply choose a level that will provide sufficient protection, announce their intentions, and act to assure everyone else, and especially India, that their actions will not justify an arms race. Pakistan’s end result will be exactly the same in either case – they will have what they judge to be an effective nuclear deterrent – but the more open path is the less risky one. Why not take it? If, tomorrow, India decides it’ll need to vastly expand its weapons program to keep up with Pakistan’s, the region will essentially be locked into an arms race that will leave both countries poorer, and the region a far more dangerous pace. The day that tipping point comes, it’ll probably be too late to avoid it. Pakistan will respond in kind, India will ramp up their efforts, and even China might get involved. That’s bad for *everyone*, including Pakistan. issues” while the West showers India with praise and Pakistan with the mantra of “do more”. On the other hand, Pakistanis may listen to China. It is not a Western-Indian conspiracy that associates Pakistan with terrorism, it is Pakistan’s own behavior. In past decades, the Pakistani state has actively supported terrorism. In current decades, the Pakistani state has been sluggish in prosecuting terrorists. What responsibility has Pakistan taken to prosecute the Mumbai terrorists? How did Pakistan handle U.S. terrorist enemy number one – Osama bin Laden? If Pakistan chooses to improve its behavior, people will surely speak more kindly of Pakistan. How can you measure whether Pakistan is deserving of criticism or is getting a bum rap? In the past, the answer was clear. Colusion was undeniable. More recently, the Pakistan Army and Air Force have been carrying out a punishing campaign against some bad actors. But the Haqqanis are in Afghanistan. So Pakistan is blamed for not having more influence on them. Then there’s the LeT. They haven’t carried out a big explosion in India for seven years. Does The ISI deserve credit for this? If we believe that there is continued collusion between the ISI and the LeT, then the answer should be ‘yes.’ But no credit will be paid unless and until the Army goes after the LeT, after which the likelihood of a big explosion is greater. “America’s war in Afghanistan,” but not Pakistan’s war too? Soviet troops in a socialist Afghanistan would seem to be a more direct threat to Pakistan than to the U.S. So far as I am aware, the Pakistanis saw it that way too. So what is the complaint here – that the U.S., Saudi Arabia, and others helped Pakistan fight a war in Afghanistan? “America impregnated Jihadi culture in Pakistan” – Seriously? The U.S. is maybe 1% Muslim, and 95% of those Muslims are moderates. Why would the U.S. even dream of doing such a thing? The problem comes about when Pakistan chose to nurture those Jihadis, turn them against India, and coddle them and protect them even when they murder the innocent. This tends to stir feelings of outrage in countries whose citizens are killed by murderers. Do their words of outrage hurt your feelings? Then bestir yourself to see that those murderers are hunted down and severely punished! The U.S. Air Force is upgrading two of its European bases to better secure nuclear weapons stored there, according to a watchdog group. I’d say there’s at least five per cent truth in this. The article itself admits that, yes, about 5% of the plutonium is weapons grade. Since making weapons from reactor grade plutonium is incredibly difficult – and India has never tested a device that did it- then the *article you quoted* backs up The Krepon’s 5% figure. You can’t just divide the amount of reactor grade plutonium by 8kg and get a number of potential bombs. That’s just silly. Rand said Global Strike initiatives include replacing support equipment in Minuteman III intercontinental ballistic missile launch control centers, and looking for replacements for two support vehicle systems that carry missiles from bases to launch facilities.